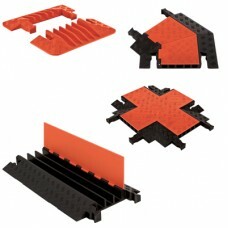 The most versatile cable protection range on the market. Suitable for pedestrian and road traffic. Well suited to utility, entertainment and industrial applications and environments. The Guard Dog® cable protection system is one of the most versatile cable protection systems on the market, with hundreds of configurations available allowing almost any number of cables to be accommodated. 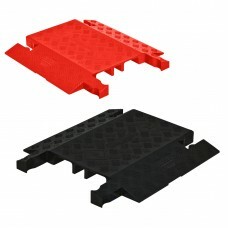 The range also incorporates a wide range of accessories including angled units for negotiating corners, ramps to make the units ADA compliant (for disabled access) and even specialist flat sided units to install flush against the edges of steps and ledges. The dog bone connector on the Guard Dog® system is very strong and highly durable. Once connected to the adjacent cable protector you can be sure that they will not become separated unless required. The low profile design is ideal for areas with heavier foot traffic and vehicles that have a lower ground clearance, providing a smoother crossing. The standard profile is capable of accommodating larger cables and can also be made ADA compliant for disabled access with additional ramp kits if needed. 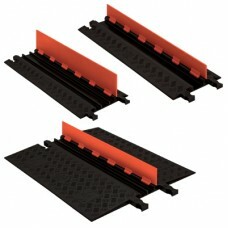 The Americans with Disabilities Act specifies a standard that cable protection ramps need to meet to ensure safe and easy access for people with disabilities, all ADA marked Guard Dog® products meet this criteria, so if you need to make an ADA compliant crossing point, the Guard Dog® has exactly what you need, with ramps to convert standard profile Guard Dog® units into ADA compliant crossing points, or low profile ADA compliant protectors you will have everything you need. Like much of the Checkers® range the Guard Dog® cable ramp system is covered in high traction patented chequering that increases surface traction, making each unit even safer for pedestrian crossing and reducing slip risks as much as possible. Each unit is marked with industry standard ANSI. Z535.3-1991 safety symbols, including; electrical warning, trip hazard (where appropriate), and ADA (where appropriate) compatibility. Ensuring that anyone working with these units, or passing over them knows their limitations and is informed of their specification.